Our UUK Boardroom is the perfect room for those important meetings, training courses and seminars. With the flexibility to be set up in a style to suit your event, the room benefits from dual aspect windows overlooking Tavistock Square. The room comes with LCD projector, flipchart and glass whiteboard included in the hire price. It also has a built in teleconferencing unit with ceiling mounted microphones and speakers allowing groups of up to 32 to be heard (charges apply). Ergonomically designed furniture, air conditioning and catering available in the room or in the Tower Room next door ensures comfort for all attendees no matter how long your meeting lasts. The room also works perfectly as a workshop or breakout space for larger meetings in our Woburn Hall or Tavistock Room. 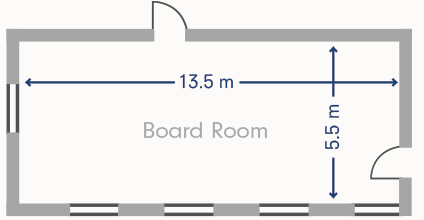 The room is 13.5 x 5.5 (LxW) metres in size. Click here for a list of the AV services available.